Monday June 20th 1898 We worked all day long with the cherries only taking time to get the meals. Will picked for us. Tuesday June 21st 1898 Worked in the cherries again today. weather cool and pleasant for the work. Will was up town after dinner. 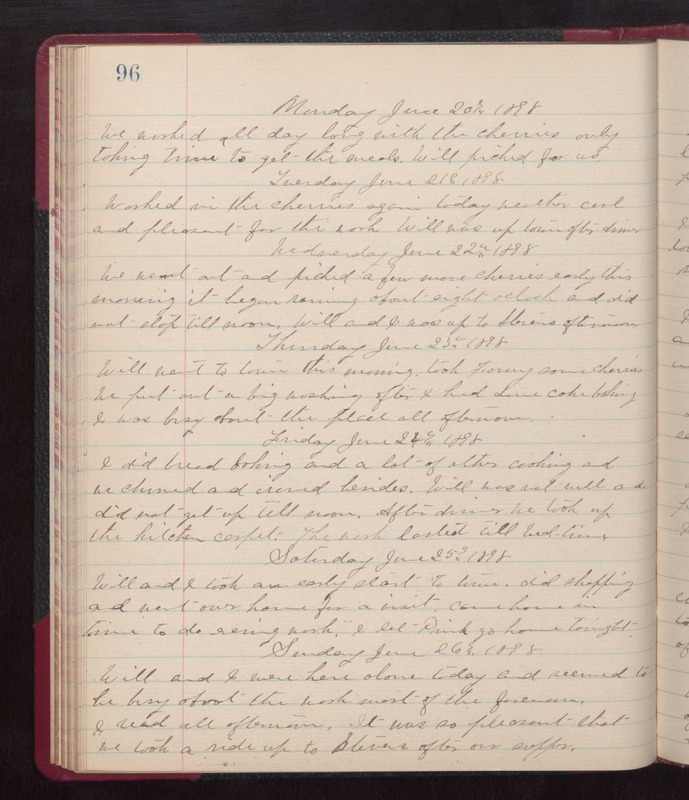 Wednesday June 22nd 1898 We went out and picked a few more cherries early this morning it began raining about eight oclock and did not stop till noon. Will and I was up to Stevens afternoon. Thursday June 25th 1898 Will went to town this morning. Took Fanny some cherries. \We put out a big washing after I had done some cake baking. I was busy about the place all afternoon. Friday June 24th 1898 I did bread baking and a lot of other cooking and we churned and ironed besides. Will was not well and did not get up till noon. After dinner we took up the kitchen carpet. The work lasted till bed-time. Saturday June 25th 1898 Will and I took an early started to town. Did shopping and went over home for a visit. Came home in time to do evening work. I let Pink go home tonight. Sunday June 26th 1898 Will and I were here alone today and seemed to be busy about the work most of the forenoon. I read all afternoon. It was so pleasant that we took a ride up to Stevens after out supper.